“Every four years, the international specialist world of joining, cutting and surfacing demonstrates its innovative force – and SCHWEISSEN & SCHNEIDEN is its forum for this purpose . In 2013, the experts in one of the key sectors of modern production technology will come together in Essen for the 18th time already. On September 16 – 21, over 1,000 exhibitors from 40 nations will present their innovations – including a large number of global innovations. The Ultra-Cut XT systems’ superior cut quality enables parts to go directly from the cutting table to welding, painting or assembly without expensive secondary operations. The Ultra-Cut XT delivers ISO Class 3 or better cuts on any material from gauge to 2-inch thick, noticeably reducing bevel and the need for post-cut finishing. On non-ferrous materials, the Ultra-Cut XT produces superior cut quality and a lower cost per cut using the Water Mist Secondary (WMSä) process, which incorporates nitrogen as the plasma gas and ordinary tap water for shielding. On stainless steel, the WMS process cuts up to 300 percent faster and lowers cost-per cut by 20 percent or more compared to systems that use Argon-Hydrogen for the plasma gas. With the ability to cut 1-inch thick steel at 80 inches per minute (IPM) and 2-inch thick steel at 30 IPM, the Ultra-Cut XT 400 can lower the cost per cut and makes it competitive with the oxy-fuel process. The Ultra-Cut XT also lowers the cost per cut by using HeavyCutä consumables for cutting at 300 and 400 amps. These consumables use a multiple hafnium insert as opposed to a single insert and feature a two-piece tip that runs cooler. Better cooling extends parts life and cut accuracy across the life of the tip, especially when piercing at higher amperages. These combined features extend consumables life by up to 45 percent, which in turn reduces cut cost per foot. 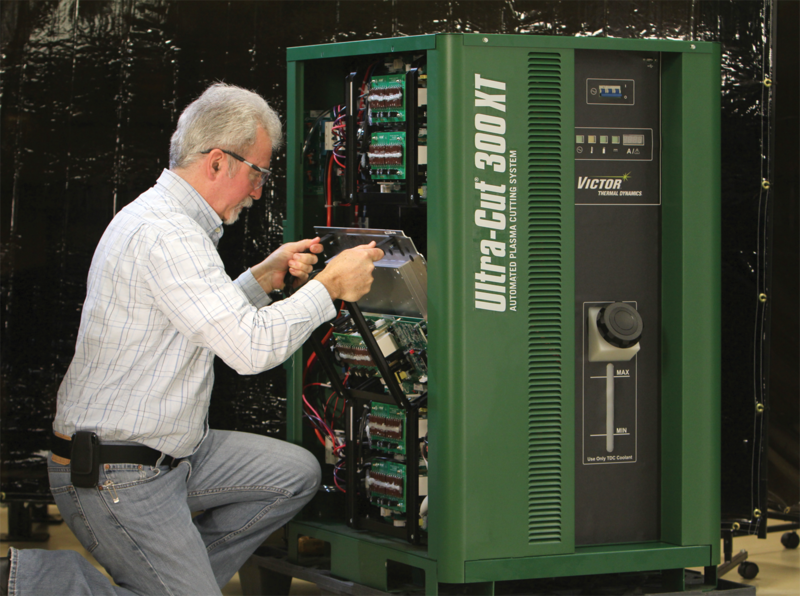 Compared to previous models, Ultra-Cut XT systems draw 20 percent less primary current and have an average electrical efficiency of 92%. They meet EU Level Five efficiency standards and help companies everywhere lower utility bills. The Ultra-Cut XT series is available in 100 to 400-amp configurations for cutting plate up to 2” (50mm) thick. All models feature a common cabinet and components. Users can increase the output from 100 amps all the way up to 400 amps by adding inverter blocks. With its modular design, parts inventory is minimized along with repair time. A LED error display indicates machine status to accelerate troubleshooting, and should an inverter block malfunction, cutting can continue with the remaining blocks. When purchasing a new automated cutting table or retrofitting an existing one, which process is best–oxyfuel or plasma? The nature of the application and cutting process both play a role. Which process will ultimately yield the lowest cost per cut—oxyfuel or plasma—after all variables are considered? The basic nature of each process immediately dictates some choices when you are purchasing a new automated cutting table or retrofitting an existing one. In automated oxyfuel cutting, a fuel gas (typically natural gas) heats the metal to its kindling temperature, where a high-pressure stream of pure oxygen rapidly oxidizes and blows away the metal. This process works with carbon steel because iron oxide melts at a lower temperature than steel. Oxyfuel does not work with aluminum because aluminum oxide melts at a higher temperature, and it won’t work with stainless steel because it doesn’t oxidize. Conversely, the high-precision plasma process works with any electrically conductive material, making it suitable for cutting steel, stainless steel, and aluminum. It heats a gas (usually oxygen, nitrogen, or hydrogen) to an extremely high temperature and ionizes it so that it becomes electrically conductive, allowing the electric arc to transfer to the workpiece. The arc’s heat melts the workpiece, and the force of the plasma and shielding gases blows away the molten metal to cut the workpiece. Assuming costs for the cutting table, controller, and gantry are similar for both processes, the key factors influencing the acquisition and operation of a cutting table are summarized in Figure 1. At first glance, you might think that many factors seem to favor the oxyfuel process, which is why it has been the preferred cutting process of many fabricators for decades. But thanks to the extremely fast piercing and cutting speeds of modern high-precision plasma systems, the choice has become much less clear-cut (so to speak), especially on material less than 1.5 in. thick. Figure 3When multiple oxyfuel torches can cut in parallel, cut costs per foot decrease significantly. Photo courtesy of C&G Systems Corp.
Oxyfuel cutting requires very little capital to implement and operate. A machine torch setup (including hoses, manifolds, and required accessories) costs about $3,000, and a multiple-torch setup can still cost less than $10,000. A cutting tip costs approximately $25 and will last for about 100 hours of cutting. Most automated systems use natural gas because, at least in North America, the cost is nearly free at $0.0001 per cubic foot. Oxygen, the single largest operating cost for the oxyfuel process, runs at about $0.010 per cubic foot. A high-precision automated system also uses oxygen for the plasma gas when cutting mild steel, but at lower volumes. Once installed, an oxyfuel system operates almost maintenance-free. Other than changing consumables, the torch, gas distribution, and manifold system are extremely robust. Oxyfuel’s primary limitation is its relatively slow piercing and cutting speeds. As Figure 2 shows, the torch may cut up to 30 inches per minute (IPM) on thin material, but the speed levels out around 15 IPM on material 2 in. and thicker. In metal 0.25 to 1.5 in. thick, slow cutting speeds drive up the cut cost per foot. However, at thicknesses of 2 in. and greater, the plasma process no longer has a speed advantage. Oxyfuel also provides an advantage when the same pattern can be cut in parallel, which enables using multiple oxyfuel torches (see Figure 3). In fact, up to eight torches on the same gantry is relatively common. Note that if the part requires multiple pierces, or if a limited part run can’t justify adding more torches, the advantage may tip back to plasma. Figure 5With a few turns, this cartridge with 100-amp consumables can be replaced with a cartridge for cutting at 400 amps. An automated high-precision plasma system costs an average of 10 times more than an oxyfuel system. Its torch consumables cost more too—about $45 for an electrode tip and shield cap—and the electrode may last for only two shifts, depending on the application. However, the speed of plasma cutting gives it a pronounced economic advantage. 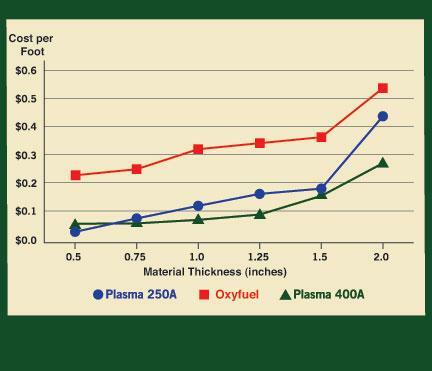 Equipment manufacturers have developed 400-amp plasma systems that increase travel speed on medium-thickness material and remain competitive with oxyfuel on steel up to 2 in. thick (see Figure 4). For example, they can cut 1-in.-thick mild steel at more than 80 IPM, while oxyfuel cuts at less than 20 IPM. On thinner materials, the speed advantage is even more significant, with plasma cutting 0.5-in.-thick steel at 150 IPM. The cost per foot is about $0.045 for plasma and $0.210 for oxyfuel. Applications involving part nests and workpieces requiring multiple pierces also are more suitable for the plasma process because the plate does not require preheating, as it does with oxyfuel. Plasma can pierce 1.25-in.-thick steel in about 1.5 seconds, whereas oxyfuel takes about 20 seconds. In places with high labor rates, including the U.S., Canada, and Europe, obtaining fast cutting speeds and cycle times is critical for profitable plasma operation. As a result of higher-capacity and higher-speed systems, plasma now is commonly found in heavy equipment, pressure vessel, ship, rail, and other fabrication operations that previously were the domain of oxyfuel cutting. Figure 6In about 20 minutes, a technician can install an inverter block to increase this plasma unit’s capacity up to 400 amps. 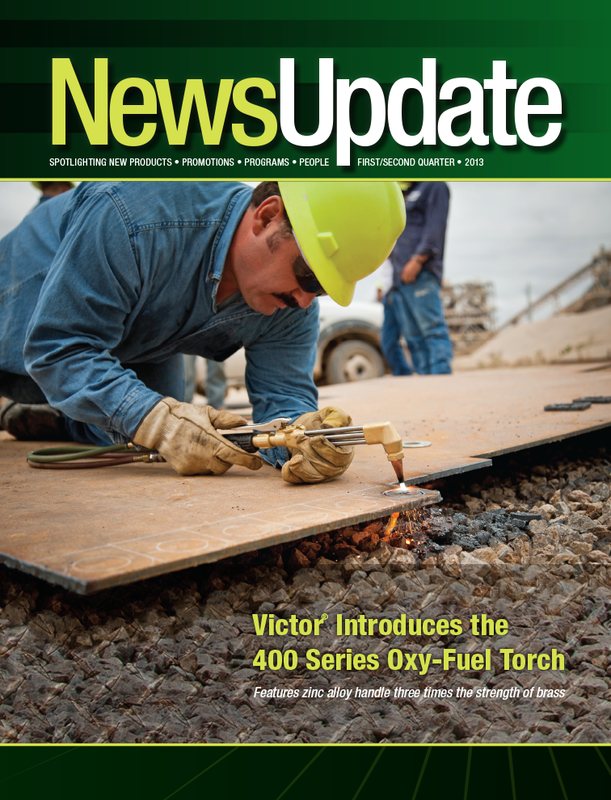 Some fabricators are using plasma to bevel pipe, as new torch configurations provide better joint access. Still, for cutting heavy steel used for infrastructure, offshore oil rigs, and mining equipment applications and for cutting pipe in the field, oxyfuel continues to offer attractive cost benefits. Optimizing cut performance, speed, and quality with either process requires changing consumables and process variables. With oxyfuel, it’s a matter of selecting the right tip and adjusting gas flow rates accordingly. 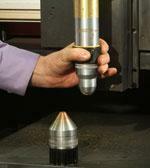 With plasma, cutting different material thicknesses requires changing torch consumables. In this case, consider systems with consumables cartridges that offer a keyless/no-tool change function, as it will reduce change time to about 30 seconds (see Figure 5). Traditionally, fabricators were somewhat boxed in when they purchased a plasma system. If they had a 300-amp system for cutting but wanted to cut 1- or 1.5-in.-thick steel at faster speeds, the best alternative was to purchase a new 400-amp system. To address this, the next generation of plasma systems uses an inverter block design that enables end users to add more inverter blocks in 100-amp increments (see Figure 6). A field technician can perform the upgrade in about 20 minutes. The flexibility of adding more output power eliminates the dilemma of investing in too little or too much capacity. Figure 7To have the right capability, many fabricators opt to equip their gantry with both plasma and oxyfuel torches. Photo courtesy of C&G Systems Corp.
With plasma, optimizing torch height during arc start and setting height after piercing greatly extends consumables life and is critical for lowering cut cost. Further, the CNCs for plasma systems have numerous capabilities (such as nesting programs that reduce the number of pierces and cutting routines that produce bolt-ready holes) to lower cutting costs. Figure 8This high-precision plasma system cut demonstrates a 0.5-degree bevel on 0.25-in. mild steel. Finally, the standard configuration for modern CNCs lets them manage up to four oxyfuel torches and two plasma torches on the same gantry. 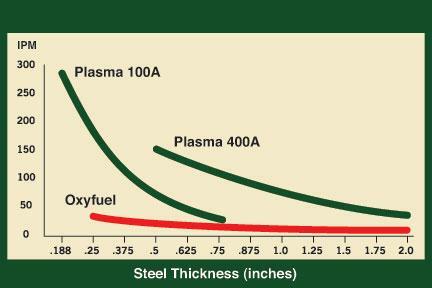 Even if you plan to use the plasma process most of the time, you can choose to equip tables with at least one oxyfuel torch for those instances when you run into thicker steel (see Figure 7). Adding an oxyfuel torch to a plasma system may add less than 10 percent to the total cost, and it can provide a good payback when it’s needed. Oxyfuel cuts with a 0-degree bevel. However, the swirl of the plasma gas inherently creates a bevel on one side of the cut. High-precision plasma cuts with a 0- to 2-degree bevel (see Figure 8), and thinner material is actually harder to cut. Note that an oxyfuel cut will have a heat-affected zone (HAZ) that is five to 10 times larger than a plasma cut. And regardless of the cutting process, weld procedure requirements often dictate mechanical removal of the HAZ. Ask for cut samples and discuss the situation with your equipment provider. Square face, perpendicularity (less than 3-degree bevel). Smooth, with nearly vertical drag lines. Little to no dross; what dross is present should be easy to remove. Minimal HAZ and recast layer (remelted metal deposited on cut edges). Good mechanical properties in welded components. It boils down to quality and cost. Which process you choose will depend on what technology can send the part to the next production step with the least amount of postcut cleaning and at the lowest cost per cut. High-precision plasma systems using argon or nitrogen for the plasma gas can produce a clean, clear, easily readable line. This is called plasma marking. Fabricators increasingly use this process to distinguish similar components (such as left and right sides) and to permanently identify components. Plasma marking uses the same power sources, controls, and consumables used in plasma cutting, enabling fast changeover between the two. Marking and cutting on the same table also eliminates the material handling time and costs associated with marking parts in a secondary operation. Plasma marking can use 5 to 30 amps of current, depending on the particular material and depth of mark desired. To create a mark at lower amperages, the plasma arc creates surface discoloration caused by the deposited heat flux. This type of marking modifies only the top surface layer; the arc vaporizes a very small amount of material (if any), which may be desirable in applications where fabricators want to paint over or otherwise obscure the marking. At higher amperages, the plasma arc melts or vaporizes a slightly larger amount of material to create an indelible mark. 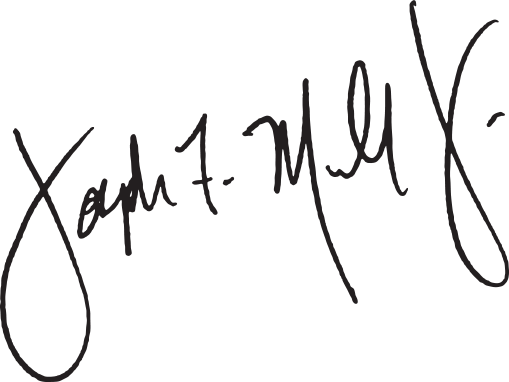 By varying process parameters, fabricators can control the depth and width of the mark. Some might, for example, want a mark to show through a heavy coat of paint or epoxy or after years of exposure in a corrosive environment. Plasma marking can also create dimples that facilitate drill starts or punching. By maximizing consumables life, you can lower your costs for an automated plasma cutter. software in cNc controls can automatically develop cutting routines that minimize the number of pierces. While cutting time might be slightly longer, reducing the number of pierces extends consumables life and lowers the cost per cut. There are two ways to maximize consumables life and lower the operating cost of an automated plasma cutter. The first option is to have a plasma cutting and CNC programming expert on staff who can optimize parameters for every step of every cutting routine. 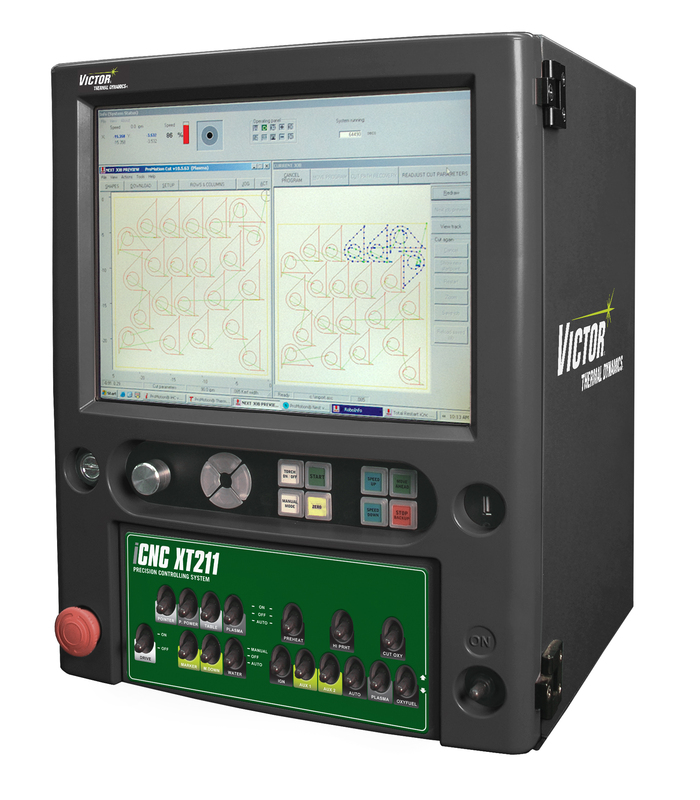 The second option is to use an integrated system and a CNC controller with the intelligence of a plasma cutting and programming expert built within it, along with a suite of software tools that enable machine operations to optimize consumables life with point and click simplicity (see Fig. 1). For making heavier cuts, such as in 1-in.-mild steel and thicker, new consumables technology can also increase arc starts to 900 at 400 amps or 1,500 at 300 amps per set of consumables (cuts were 11 seconds in duration). In any event, a quick review of the causes of consumables wear is in order. The primary causes of electrode wear are the number of arc starts and stops, cutting time, material thickness and poor gas flow and/or quality. 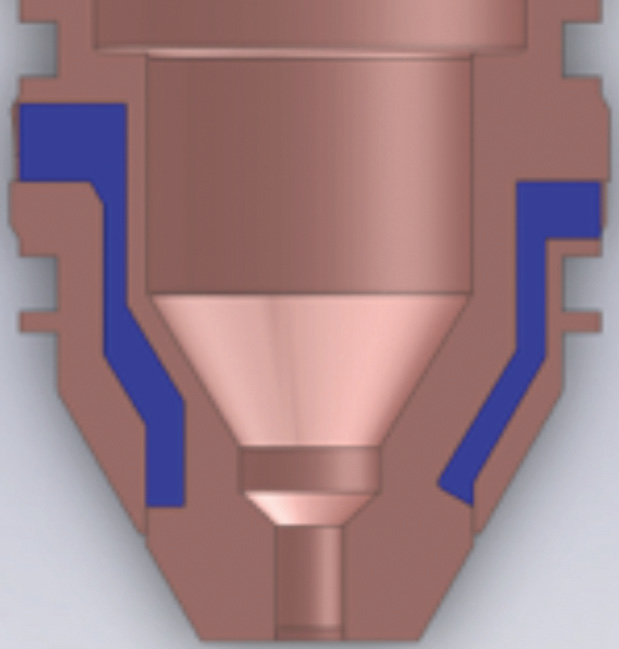 The tip of an automated plasma electrode features an insert made from hafnium, which forms a molten puddle when the arc is in operation. The wear mechanisms of hafnium are directly related to its molten state. Imagine a spinning bucket of water; spin it quickly enough, and some of the water spills over the edge of the bucket. This basically represents what happens with molten hafnium. Fortunately, manufacturers can control hafnium wear by controlling the gas and current around the plasma arc. While O2 plasma gas provides weld ready precision cuts, starting the arc in a pure oxygen environment is quite oxidizing. It creates an excessively thick oxide layer on the electrode that eats into the electrode body and causes premature wear. Regardless of the plasma gas for cutting, most advanced cutting systems use less oxidizing gases, such as nitrogen or air, during arc start to extend electrode life. Ramping the current and gas in a coordinated manner also minimizes the thermal shock. This is like slowly opening the floodgates of a dam instead of waiting until the dam bursts. A gradual rise (a time still measured in milliseconds) is far superior to instantly putting hundreds of amps through a cold electrode with layers of oxide and other components left over from the previous cut. Instead of the layer melting slowly, the instant energy rise causes the layer to crack and disintegrate, leading to premature electrode wear. Controlling torch height during piercing is an especially critical component of extending consumables life. Note that a responsive torch lifter paired with a computer control is essential to preserve consumables life and ensure cut quality. Controlling torch height at various phases of piercing a 1-in.-thick, mild-steel plate provides a good example. the Victor Thermal Dynamics iCNC XT controller adjusts the height of the XT torch during arc start. Notice that after arc initiation, the controller raises the torch in a “pierce retract” move to maximize consumables life. The ideal starting torch height will be about 0.5 in. The CNC will start the power source’s pilot arc to fire and ramp current to ionize the plasma gas. Next, the torch goes through a pierce retract or elevation height adjustment. The system holds that height until the plasma stream pierces the metal (a pierce delay). The torch then drops to its cutting height. See our video. If at any point during this process the torch height is off by a millimeter or the current and gas ramp timing are off by a few milliseconds, any number of undesired consequences can occur. This includes molten metal splashing on the torch (shield cup wear, tip orifice wear), a pilot arc that continuously tries to ignite (tip wear), too long of an arc (tip wear), an incorrect pierce delay that will gouge the metal (leading to rework or scrap) and a poor cutting height (which largely controls cut quality). This is where the value of a CNC controller begins to shine, as the system will automatically set all of the variables after the operator enters material type, material thickness and plasma and shielding gas types. this electrode, which uses multiple hafnium inserts, can double arc starts. Speaking of gas, good gas control also contributes to cut quality and consumables and probably more than people realize. For example, incorrect plasma and shield gas settings entirely change the arc characteristics. If the plasma pressure is too high or too low, the arc may be harder to start. That consumes the electrode much faster, as will dirty, oily or moist air, which emphasizes the need for a filter and dryer (see Fab Shop’s April 2013 issue for more information on proper air control for a plasma system). While manual gas control boxes are available, the industry is largely favoring automatic gas controllers matched to a CNC as part of an even larger trend toward integrated systems. Because the CNC can instantly set and control gas pressure, it provides a better level of quality control and eliminates the changeover time associated with manual controls. Many fabricators initially purchase an air-air plasma system (air for both the plasma and shielding gas, with an air-cooled torch). However, when cutting table utilization reaches a certain threshold, it makes good economic sense to step up to a dedicated automated plasma system that features a liquid-cooled torch and other advanced technology. Consumables will cost $45 or more, but they last much longer and ultimately lower costs. Even a basic system can provide 1,200 arc starts per set and lower cost per cut. to cut like new long after other consumables have degraded to the point where they can’t produce a precision cut. Plasma system owners grumble about consumables costs, but don’t realize that much of a plasma system’s capabilities result from the thousands of engineering hours that go into consumables and torch design. Further, manufacturers continue to make strides to extend consumables life. For example, Victor Thermal Dynamics has developed a new type of consumable for cutting at 300+ amps that uses multiple hafnium inserts (see Fig. 2) instead of a single insert. Tests proved that the parts life can be up to four times higher, which results in considerably lower running costs. Tip (nozzle) technology has also improved recently with cups that cool all the way to the orifice (see Fig. 3). Better cooling extends consumables life when piercing at a higher amperage, a more common occurrence as plasma systems become prominent for cutting metal in the 0.750 in. to 2 in. range. As the numbers in this article show, investing in the right technology up-front is one key to extending consumables life and ultimately lowering the cost per cut. In today’s economy, or any economy, that makes good business sense. Great Savings on Popular PLASMA CUTTING Equipment! The Cutmaster® TRUE™ Series – Versatile, flexible, and now more affordable! Contact your local Victor Thermal Dynamics distributor for full details!